Sometimes your fleet needs more than just fuel to stay on the road. That’s why we’ve partnered with Meineke and Maco to create the Meineke Fleet Solutions MasterCard®. Not only can you purchase fuel for your fleet, but you can also empower your drivers to service vehicles within one account. Whether it’s standard maintenance or a surprise service call, this card allows you to keep your fleet expenses in one place, with the security and control you’d expect from a fleet fuel card program. 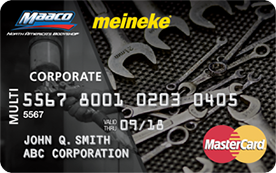 Daily spend limits, purchase category control, and standard reporting are all included in the Meineke Fleet Solutions MasterCard® program. Rest assured that the fuel purchases and maintenance that your fleet needs are the only purchases that can be made based on the business needs you identify for your fleet and drivers. *Purchases must be made with the Meineke Fleet Solutions MasterCard® and the account must be in good standing. Not valid on aviation, bulk fuel, propane, or natural gas purchases. Unleaded and diesel grade fuels are included. The Fuelman Discount Network is a select group of fuel locations that allow cardholders additional savings. For a list of participating sites, visit www.fuelmandiscountnetwork.com. The Meineke Fleet Solutions MasterCard® is issued by Regions Bank, pursuant to a license by MasterCard® International Incorporated. MasterCard® is a registered trademark of MasterCard® International Incorporated.